The period covered by Arts:Search is 1902. Available now. Monthly. Little is known about this scarce Italian decorative art journal. So far only one issue (vol.1, no.1, January 1902) has been digitized by Arts: Search. Further issues will be digitized if they can be traced. This issue for 1902 contains articles on the Esposizione Internazionale d'Arte Decorativa Moderna (International Exposition of Modern Decorative Arts) held in Turin in 1902; the decorative artist Giacomo Cometti (1863-1938); and the sculptors Celestino Fumagalli (1864-1941) and Edoardo Rubino (1871- 1934). 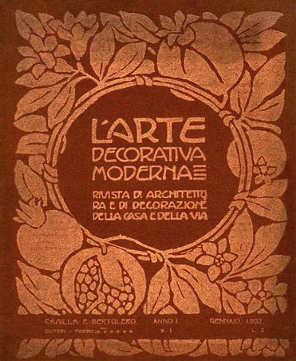 L'Arte Decorativa Moderna is thought to have ceased publication in 1912.